The swagger and confidence are typically military and it gets further accentuated by the Olive Green uniform. An Ashoka badge on his wide shoulders adds to the lustre. Yet Dr Deepak Rao, the man in uniform, is not a regular army officer. As can be expected from a man of his talents and vocation, he is rather low profile and superbly fit. So when cricket captain Mahendra Singh Dhoni and Olympic gold medallist shooter Abhinav Bindra were recently awarded an honorary rank by the Territorial Army, the man standing between them aroused a lot of curiosity. 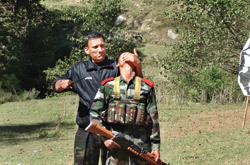 Dr. Deepak Rao pursues a somewhat unusual profession: he trains soldiers and jawans of the Indian armed forces and paramilitary in the deadly art of unarmed combat at close quarters. So talented is the man at his business that the Indian Army has conferred upon him the honorary rank of a Major. Treading this off-beat path, Rao has his wife Seema for company. In 2010, both of them – Seema is also a medic – completed 17 years training about 15,000 soldiers from the Indian armed forces and police in close quarter combat and counter terrorism related subjects. “I am full time into training the forces as a guest trainer for the army, paramilitary forces and the police. My wife sometimes accompanies me and teaches unarmed combat as she is a senior black belt in martial arts,'' Rao told TSI. Just how good is a guy who can train well-equipped fighters? It obviously calls for high levels of proficiency, skill and aptitude, all essential ingredients in the make up of a man required to prepare bare knuckled combatants. Close quarter battle (CQB) scenarios are common to special forces, the army and counter terrorism operations where the enemy comes as close as 30 meters. What you require then is that special training to be physically and mentally skilled, the aptitude to react in a split second to finish off the enemy. Things can be better understood in the context of the 1999 Kargil conflict. Once the Indian infantry and artillery had re-established their dominance at the peaks, it was left to the close combat specialists to clear the bunkers and neutralise remnants of those fleeing the Indian fire and the only way to do it was engaging in close quarter battles (CQB). And that is what happened. What motivates Rao, the prizefighter? “Soldiers of our country lay down their lives for securing our peace and well being. It’s the height of sacrifice and the height of bravery. This has always touched me and I grew up on the movies made on Indian soldiers and their valour. This has spurred us to do something for the uniformed forces for a long time,” he says with a touch of emotion in a world otherwise dominated by action, power and subterfuge. In their missionary zeal, their personal life has taken a backseat. Such is their devotion to national security and commitment to work that they have preferred to stay childless. As Dr Rao puts it, “We both have been working for the forces for last the 18 years. In a way we actually belong to the forces. We kept postponing having children and raising a family to enable us to continue our hectic and rigorous schedule of travel to various locations where we were sent by the forces. Finally we concluded that it was too late to come back to a civilised life, make a home and raise a family. So let us continue serving and relate to others. Today we have interactions with fellow uniformed personnel and we live a satisfied interactive life within the uniformed family.” Some commitment that. Their 17 years together have been arduous for both in training terms. “Being a doctor, I do part time consultation for a few select patients. We do corporate workshops on fitness and health matters as and when time permits from our hectic forces' engagements. Since we spend most of our time outstation with the forces, we are hardly at home. So, needs and costs of maintaining a house and lifestyle are low,” he says. Even as we talk, the couple is busy packing their bags, ready to move to a new destination. Their travels take them to the harshest terrains and locales to be with soldiers and other security personnel. And there is no respite. Their schedule for 2012 is chalk a block full. Says Rao, “I am going to be even busier with the work that is being entrusted to me by the forces. I have given commitments and planned a systematic training schedule of certain units within the army so I shall be very busy and outstation for at least a year. Besides this, I am engaged as a resource for home ministry for close combat training.” Phew, how much can a man pack? Dr Seema Rao puts it delicately, “This schedule keeps me so busy that I do not even have time to pay my bills.” In the course of such a power packed existence, there is no scope to let their physical and mental guards down. Happily for the country, they are willing to oblige. Damascus Does Not Believe In Tears!